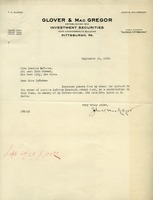 Berry informs Neal that the meeting with Mr. Bierwith [Bierwirth] and Mr. Jones has been arranged for the morning of the 7th rather than the 5th due to illness. 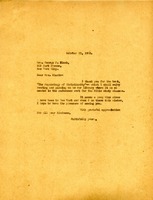 This is a note from John W. MacGregor to Lucille LaVerne indicating a $100 gift to the Mountain School Fund in honor of his mother-in-law. This is followed by a note from LaVerne to Miss Berry telling her of the donation. 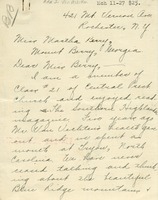 Miss Berry then sent a letter to MacGregor thanking him for the gift and urging that he come visit. 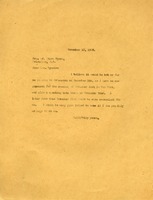 Miss Berry also sent a letter to LaVerne requesting that she direct any gifts to be sent directly to the school for record keeping purposes. The manager, A.E. 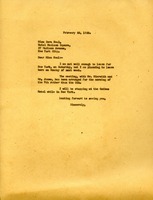 Martin, of Bon Air-Vanderbilt Hotel, reports to Martha Berry that the representatives from her school were pleased with their visit to the hotel and are welcome back the following witner along with Miss Berry herself. 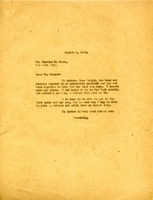 A piece of paper containing the address of Mrs. Mary P. Hoopes along with a date and the amount of $150. Martha Berry thanks Anna Hollenback for a sweet letter and generous gift, especially in a time of great need. Miss Berry invites Miss Hollenback to Berry for a visit and offers her company on a trip to New York. Letter says that Martha Berry is in New York and will not be back in Rome during the Hilles' visit there, and invites Mr. & Mrs. Hilles to visit the school anyway. 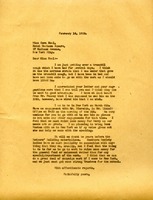 Martha Berry writes to Robert Ely to accept the offer to speak of the work of the Berry Schools after a lecture, even though she will only be given a few minutes to do so. Martha Berry informs Mr. Crane that she cannot make any plans because her sister was critically injured in an automobile accident. She says that she hopes to be in New York later to visit. 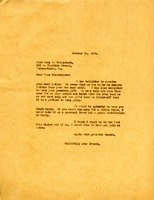 A letter sent from Martha Berry to Mrs. George P. Black expressing her gratitude for sending a book on Christianity. Martha Berry relays the message of how useful the book will be for the Bible study classes. 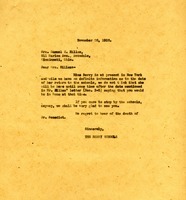 A letter from Martha Berry which tells of her struggle with a bronchial cold, but that she is expecting to be in New York by March 6th. Charlotte Baker described how the secretary "spoke very well" and that the personal touch made an impression on the girls. She sent Martha Berry a $25 donation. 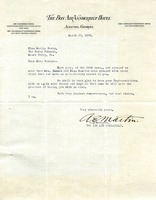 Letter was recorded as received by the Berry Schools on March 19, 1928, as noted in the typescript at the top of the letter. 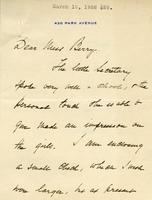 Miss Berry informs Miss Walker that she has written Miss Florence Schopp that she will be happy to see her in New York. Miss Berry also gives Miss Walker an update on the work at the Schools. Ada Van Vechten recalls a visit to the Blue Ridge mountains of North Carolina, contrasting the beautiful scenery with the poverty they witnessed among the residents of the area.